Bacterial arthritis is a highly destructive form of joint disease most often caused by hematogenous spread of organisms from a distant site of infection. Direct penetration of the joint as a result of trauma or surgery and spread from adjacent osteomyelitis may also cause bacterial arthritis. Any joint in the body may be affected. Gonococcal arthritis causes a distinct clinical syndrome and is often considered separately. * various gram-negative bacilli, including Escherichia coli, Salmonella, and Pseudomonas. Rarely, fungi or mycobacteria cause the infection. Anaerobic organisms such as gram-positive cocci may infect children over age 2 and adults. H. influenzae most often infects children under age 2. 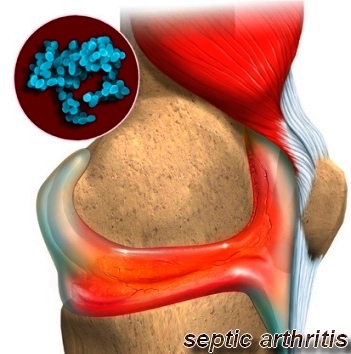 Various factors can predispose a person to septic arthritis. Any concurrent bacterial infection (of the genitourinary or upper respiratory tract, for example) or serious chronic illness (such as cancer, renal failure, rheumatoid arthritis, septic lupus erythematosus, diabetes, or cirrhosis) heightens susceptibility. 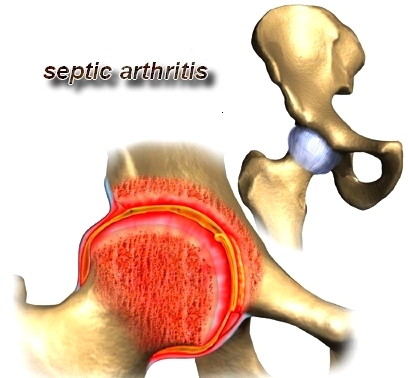 Consequently, alcoholics and the elderly run an increased risk of developing septic arthritis. Susceptibility also increases among patients with immune system depression or a history of immunosuppressive therapy. I.V. drug abuse can also lead to septic arthritis. Other predisposing factors include recent articular trauma, joint surgery, intra-articular injections, and local joint abnormalities. 1. Highly vascular synovium is invaded by hematogenously spread bacteria. 2. WBC enzymes cause necrosis of synovium, cartilage, and bone. 3. Extensive joint destruction is rapid if infection is not treated with appropriate IV antibiotics and drainage of necrotic material. • The most common nongonococcal organisms are Staphylococcus aureus, b-hemolytic streptococci, and gram-negative bacilli. 1. Synovial fluid leukocyte count is usually elevated >50,000 cells/mm3 with a differential count of 80% or more polymorphonuclear cells. 2. Counts are highly variable, with similar findings in gout, pseudogout, or rheumatoid arthritis. 3. The differential diagnosis of sy-novial fluid abnormalities is described in Table 2-192. Treatment for septic arthritis requires monitoring of progress through frequent analysis of joint fluid cultures, synovial fluid leukocyte counts, and glucose determinations. Bioassays or bactericidal assays of synovial fluid and bioassays of blood may confirm clearing of the infection. Codeine or propoxyphene can be given for pain, if needed. (Aspirin misleadingly reduces swelling and may mask fever, hindering accurate monitoring of progress.) The joint may be immobilized with a splint or put into traction until the patient can tolerate movement. As the infection resolves, exercise is added to the treatment regimen to restore strength and mobility. Reconstructive surgery is warranted only for severe joint damage and only after all signs of active infection disappear. This usually takes several months. 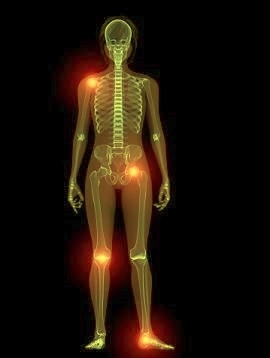 The patient is likely to need arthroplasty or joint fusion. Prosthetic replacement is controversial because it may exacerbate the infection; it has been used successfully when the femoral head or acetabulum has sustained damage. • With prompt treatment, complete resolution is expected. • Delay in treatment may result in permanent destruction of cartilage and loss of function of the affected joint.